For more than 25 years, Peggy Tomsic has successfully represented defendants and plaintiffs in trials and appeals involving business litigation in federal and state courts in the Intermountain West, in California, and on the East Coast. Her business litigation practice includes trade dress, trademark, and patent infringement; breach of contract; breach of fiduciary duty; common law fraud; securities fraud; and eminent domain. She also has extensive experience representing clients in mediation, arbitration, and grand jury proceedings. 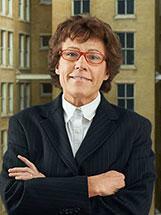 In 2008, Peggy expanded her practice to include serving as a mediator and arbitrator. Peggy was awarded an AV rating by Martindale-Hubbell (TM) in 1994. She was recognized by her peers from 2006-2009 as one of the Legal Elite in Utah; was recognized in 2007, 2008, and 2009 in Super Lawyers (TM) as one of the Top Attorneys in Business Litigation; and was listed in 2008-2009 in Marquis Who's Who in America. Peggy was born in Price, Utah and grew up in Moab, Utah. Peggy has been named in Super Lawyers (TM) magazine as one of the top attorneys for 2007-2009 in the Mountain States region. Peggy was co-counsel with Magleby Cataxinos & Greenwood partner James E. Magleby in a more than five-week jury trial, in which the firm won a unanimous verdict of over $133 million for the firm's clients in a theft of trade secret, breach of Confidentiality Agreement, and breach of fiduciary duty case. The jury verdict was affirmed by the Utah Supreme Court in May 2016.